The Patriots hit the field on Gillette for their last home preseason game tonight as they’ll take on the World Champion Philadelphia Eagles in Week 2 of the preseason. The game will be televised on WBZ-TV 4 with Bob Socci on the play-by-play, Scott Zolak doing color commentary with Rob Ninkovich the sideline reporter and Andy Hart and Paul Perillo providing commentary from the studio. The stakes are much lower for both teams since they last met in February for the Super Bowl where the Eagles won 41-33 for their first Lombardi Trophy. But although it is just preseason and the score ultimately doesn’t mean anything at the end of the day, each team is looking to accomplish several things and solidify their rosters. WIth the limit at 90 players right now (the Patriots have 89), the teams will have to get down to 53 in just a couple of weeks now. Each team has several spots up for grabs. Neither Tom Brady, Carson Wentz or Nick Foles played in their team’s preseason opener but all three should see some playing time this week as it is time for the QBs now to work off the rust. There have been some interesting newsworthy stories this week, especially so since this is a preseason game. Lane Johnson continues to talk smack about and to the Patriots as well as Patriots fans. His “look at me” schtick will no doubt continue after the game as regardless if he plays a down, as he’s a self-styled expert on all things about the Patriots locker room although he’s never played here. And Philadelphia fans have purchased a billboard on Route 1 leading into the stadium in a hilarious dig at the Patriots similar to the 28-3 trolling New England did to Atlanta. Crazy to see these things before a preseason game. So from a Patriots perspective, as there is a football game to be played here is our list of things we’ll be looking for this week as the Patriots play the next preseason game against a very good Eagles team. How Long Will Tom Brady Play? Brady after having his snaps reduced in training camp for about a week has been right back at it this week, looking like he got a typical workload for training camp. Jim McBride from the Globe reported that Brady was suffering from a sore back last week, although Brady probably could have played if it had been a regular season game, he sat out the 1st preseason contest. He typically doesn’t play in the first one anyway so he was a cheerleader on the sidelines for Brian Hoyer and Danny Etling. I would expect Brady to play about midway thru the first quarter and try to get some chemistry going with his wide receivers, several of whom are banged up right now. 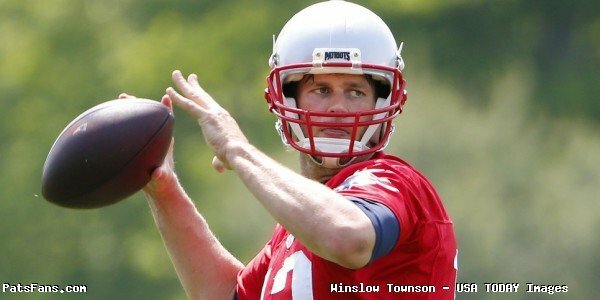 But it is important that Brady gets his own work in before the regular season. This week and next are his two games to knock off the rust. The final preseason game is usually a final look at guys on the bubble and one he normally doesn’t play in. We expect to see him hook up with Rob Gronkowski a bit this week as Gronk sat last week as well. Wide Receiver Reps Time For Stepping Up: Kenny Britt hasn’t been a full participant all summer and at the end of practices both Phillip Dorsett and Julian Edelman came up limping a bit. So the WR position has yet to look like the coaches have envisioned it for the regular season thus far. It is imperative that all of the wide receivers get some work in with Brady and build up their chemistry, timing and trust factor with the starting QB. Britt probably won’t play again and it will be interesting to see if Edelman and Dorsett make it on the field this week. Of course, it is also an opportunity for everyone to showcase their talents, especially those players who are on the bubble. 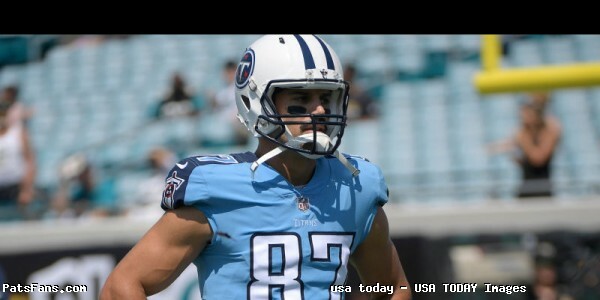 And in the case of Eric Decker, whom the team brought in just a couple of weeks ago, it should be a very important week. Decker is a player who has been very productive in the league but after a couple of serious injuries and at an age where it is fair to wonder if his best days are behind him, Decker is far from a lock at this point. Especially considering that he was just brought in. He doesn’t know the offense well yet and was plagued earlier in the week with several drops. Tonight’s game and next week will be a big measuring stick for him. Cordarrelle Patterson is another guy who has had a strong camp but hasn’t had a ton of reps with or catches from Brady during the practice sessions. Tonight would be a prime opportunity for him to build some of the trust factor with #12 and work into an integral role in the offense. Ditto for young guns Devin Lucien, Braxton Berrios and Riley McCarron. Will To See See More From Ju’Whaun Bentley and J.C. Jackson: The two rookies both had strong outings in the first professional, albeit, preseason games. Both got off to impressive starts last week against the Redskins and this week, we’ll see if they can continue to build off of that against a much better football team in the Eagles. Bentley showed the type of physicality on the goal line that the coaches love, where he read the play, and then flew up into the hole and blew up the play for no gain that we expect from Dont’a Hightower. But for a rookie, he showed a surprising level of comfort within the defense to call the plays and wear the green dot communication device. That shows a level of trust from the coaches and also that his development is coming along quickly, something Hightower alluded to early in training camp. Jackson began turning heads at OTAs this spring and has carried it thru minicamp, training camp and the first preseason game. The UDFA rookie from Maryland has been impressive with his technique and compete level from Day 1 and was thrust early in the process opposite of Stephon Gilmore to show what he could do. The results have been very impressive thus far. He’s definitely in line to earn himself a roster spot on this year’s team and he’ll be a player to watch tonight. And we could say the same thing about young RB Ralph Webb who looked strong in his professional debut last week. He still has a long way to go, can he parlay a strong performance into added reps and production two weeks in a row. Jason McCourty’s Time to Shine is Now: Speaking of cornerbacks, the case of Jason McCourty has been a strange one thus far of his time in New England. He has been a regular member of the second rotation at the corner so far during training camp but didn’t play a snap against the Redskins. If the absence was injury related, McCourty didn’t say anything to the media about it. Of course, Bill Belichick isn’t going to say much on the subject. He waxed mid-season form Bill when approached on McCourty’s lack of playing time last week. “The guys we play, we play. The guys who didn’t play… didn’t play,” Belichick said on Monday. “We’ll play other guys this week, and we’ll see how it goes. 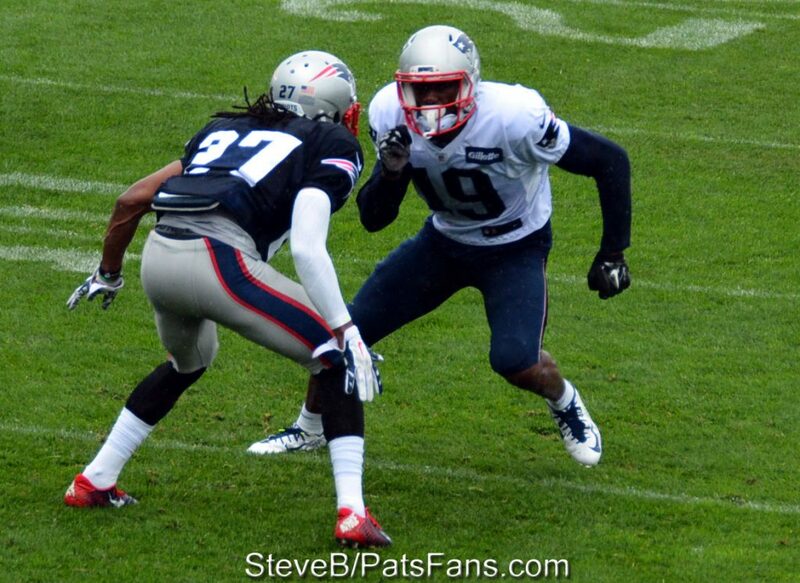 We expect to see a lot more of McCourty this week against Philadelphia and perhaps get an extended amount of reps. He did practice with the first team unit on Monday so perhaps it was just a case of Belichick knowing what he has in some players and letting them sit to that he has an opportunity to gauge other players. Tonight will be an interesting one to see what McCourty brings to the table. Eddie Pleasant or Jordan Richards: Most Patriots fans every summer have Richards circled on the cut list but he’s now in his fourth year with the team. He has been a good STs performer but has struggled mightily when asked to play defense. Last year, because of injuries, he played an extended role defensively and things didn’t go well at all for him, most notably in the Super Bowl. That carried over to the first preseason game against the Redskins where he missed several tackles due to taking a poor angle, something we’ve mentioned time and again here. Pleasant is an established veteran who played for several years with the Texans as a player who fits the same mold. He’s been a solid STs presence who can fill in defensively when needed. Pleasant has looked better than Richards defensively so far, although that is almost like damning with faint praise. If he can pick up the STs role as well as Richards, he may supplant the veteran from the roster. Both may see the intriguing rookie tight end Dallas Goedert on the field tonight. We really liked Goedert during the draft process, the rookie from S. Dakota St. had a very impressive debut of his own against the Steelers last week, he caught 4 passes on five targets for 66 yards and a touchdown. Strong Play on the Edge From Wise/Rivers: The two second-year players on the edge had very solid games a week ago against Washington and we are looking to see more from them as they continue to progress this summer. With Trey Flowers and Adrian Clayborn, the Pats are looking to build a solid rotation on the edge, something that was woefully missing last season. Wise has looked very solid in his second season and appears stronger with a better array of moves in rushing the passer this season. He had a good rookie campaign in 2017 and it was expected that he’d make a big jump in production with a year in the system and getting bigger and stronger in the strength and conditioning program. Rivers seems completely recovered from his ACL surgery and looks bigger and stronger than he did a year ago after being the team’s top draft choice after coming from a small school in the NFL Draft. He showed good explosion off the line and good speed to power, pushing the offensive tackle backward on roller skates. It was a very encouraging sign that he’s all the way back. If the team can keep getting similar production from their two 2nd year edge players, one of the bigger worries about the defense, their pass rush should be significantly better in 2018. This entry was posted in 2018 Patriots Training Camp, NFL Commentary, NFL News, Patriots Commentary, Patriots News and tagged 2018 Patriots preseason, 2018 Patriots season, 2018 Patriots Training Camp, 53 Man Roster Projection, Bill Belichick, Chris Hogan, Deatrich Wise, Derek Rivers, Dont'a Hightower, Eddie Pleasant, Jordan Richards, Julian Edelman, New England Patriots, NFL, Patriots, Patriots edge rushers, Rob Gronkowski, Tom Brady, Trey Flowers on August 16, 2018 by Steve Balestrieri. Football is back…finally. The Patriots begin the 2018 preseason with a home tilt against the Washington Redskins. 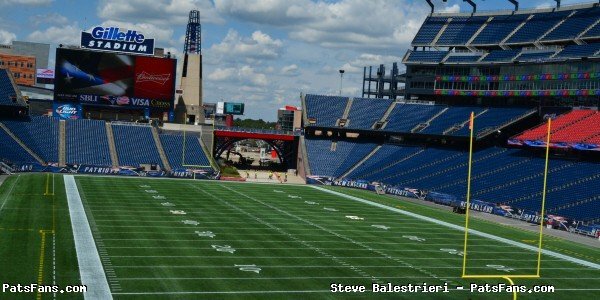 The kickoff is scheduled for 7:30 p.m. at Gillette Stadium and it is supposed to be hot and steamy around kickoff time. The game will be broadcast on WBZ TV4 with the Patriots radio crew of Bob Socci, Scott Zolak holding down the play-by-play and color duties, with sideline reporters Rob Ninkovich and Steve Burton. Andy Hart and Paul Perillo from Patriots Football Weekly will provide frequent commentary from the studio. This will be the 22nd meeting between the two teams in the preseason. The Patriots and Philadelphia have met 22 times as well and have only played the Giants in the preseason (27 games) more. However, this game will likely have little bearing on who starts the regular season for the Patriots or the Redskins. While both starting QBs, Tom Brady and newcomer Alex Smith for the Redskins may make a cameo appearance, one wouldn’t expect them to play more than a series, if at all. But there are a lot of players on both teams that need to perform well during the preseason as they hope to make each team. Right now the rosters are set at 90 players and each team can keep only 53. On the Patriots, there are probably 39-40 players who are locks to make the roster and another 3-4 more who are near locks. That leaves an awful lot of competition for the bottom half of the roster. Left Tackle Position: The Patriots traded for Trent Brown this spring and after losing long-time left tackle Nate Solder in free agency to the Giants. Brown is huge, 6’8, 380 pounds but moves well for a big man. 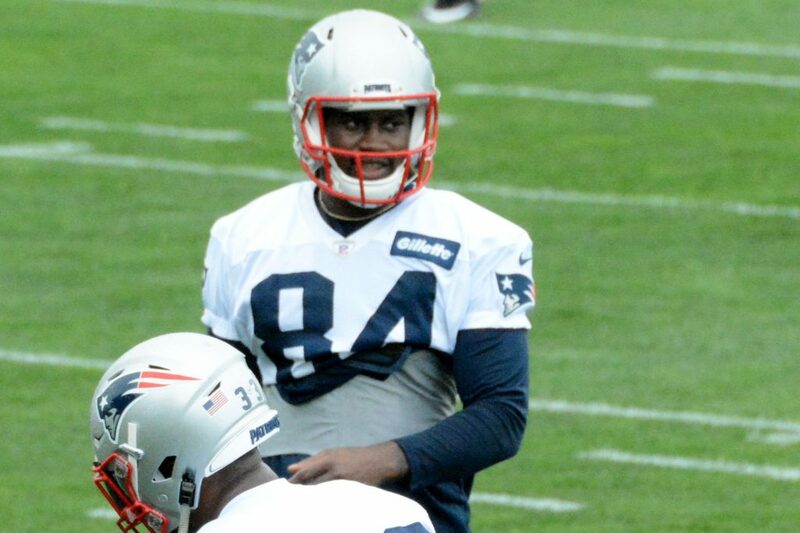 He’s had a good training camp up to this point but tonight will be his first game action as a member of the Patriots. The team invested a first-round draft pick on G/T Isaiah Wynn from Georgia just hours before trading for Brown. He’s played mostly tackle with a bit of guard thrown in this summer on the left side but he’ll get some work at both. Wynn is small for an NFL tackle at 6’2, 311 but he makes up for with being gifted athletically. They seem to be taking the same approach with Wynn as they did with Solder, they’ll let him learn the ropes for a year under Dante Scarnecchia, while getting frequent reps to earn some experience. While all signs point to the pair being just fine this season, until they get on the field and show some work against opponents, there will be questions. But with Scarnecchia being the tough love teacher, I would expect to see Wynn start at some point this season. 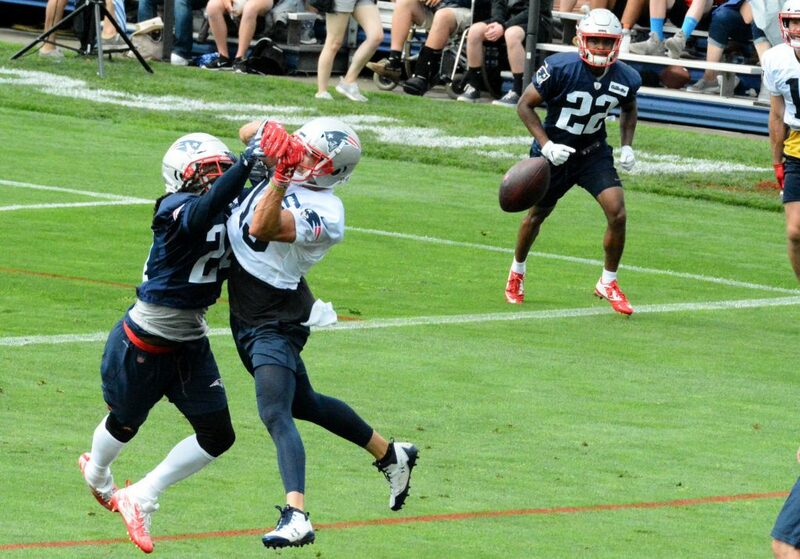 Cornerback: With Malcolm Butler now a Tennessee Titan, the Patriots had a hole at the CB spot opposite of Gilmore. Many of the national sites are calling Butler’s loss the Patriots top CB last year. But in reality, since about halfway thru the season, it was Gilmore who was the better of the two and down the stretch and into the playoffs there was no doubt about that. 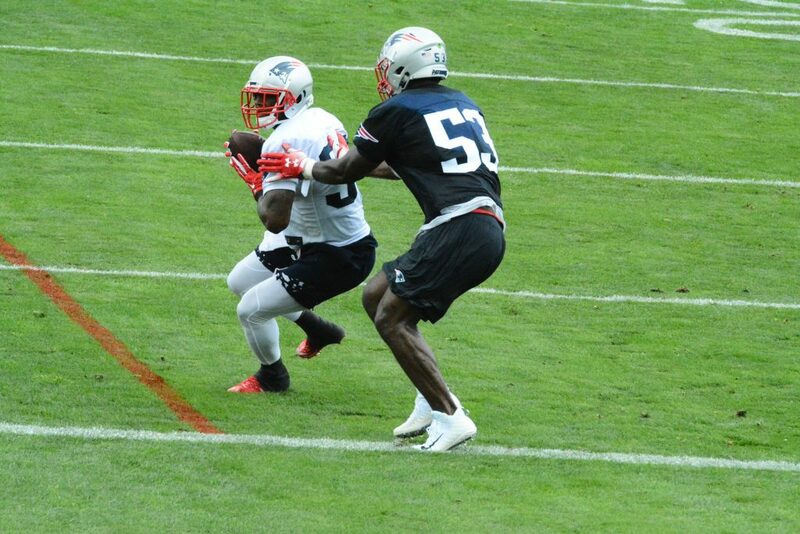 Now there seems to be a two-way battle between veterans Jason McCourty and Eric Rowe. Both have had their good moments during training camp And each brings a little something different to the table but it may end up being more a case of who the opponent is, the coaches may decide to go with the better matchups. However, waiting in the wings is unheralded rookie J.C. Jackson from Maryland. Jackson turned some heads during OTAs and minicamp and got some reps opposite Gilmore. He has since gotten more in training camp and looks like he belongs. He’s not overwhelmed at all Second-year player Ryan Lewis has the prototypical size that teams are looking for and has turned in a solid training camp as well. In the slot, rookie Duke Dawson has gotten a lot of reps and has played well. But Jonathan Jones just came off of PUP and will have something to say about that. It is doubtful, however, that Jones will play so soon. Running Back: With 1st round draft pick Sony Michel on the shelf after getting fluid from his knee drained, it leaves a decent sized hole that two veterans will be fighting for a roster spot over. The Patriots brought in Mike Gillislee last year, but overall he’s been disappointing. He’s missed some playing time during camp this summer, which isn’t helping his cause. The team signed former Bengals back Jeremy Hill this offseason and he’s had the upper hand so far during training camp. Hill brings an element in the passing game that Gillislee doesn’t have and has run the ball pretty well so far. These two are probably fighting over one roster spot so these preseason games all become very important for each of them. Edge Rushers: The Patriots defense was not good getting after the quarterback a year ago. Trey Flowers had a good year and the team got a decent rookie season from Deatrich Wise but had little else. They’ll have to be much better this year at getting pressure on opposing QBs. During free agency, the team went out and got veteran Adrian Clayborn. 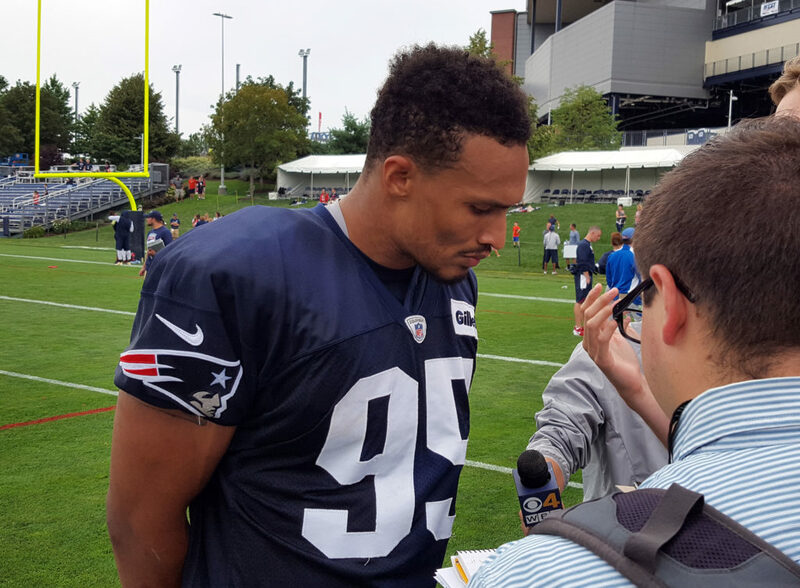 They also got back last year’s top draft pick Derek Rivers as well as Dont’a Hightower on the defensive front seven. Rivers is starting to round back into form from his torn ACL from last preseason and it will be a test for him to get back into game action. He should be part of a four-man rotation with Flowers, Clayborn, and Wise, who is having a terrific camp thus far this summer. 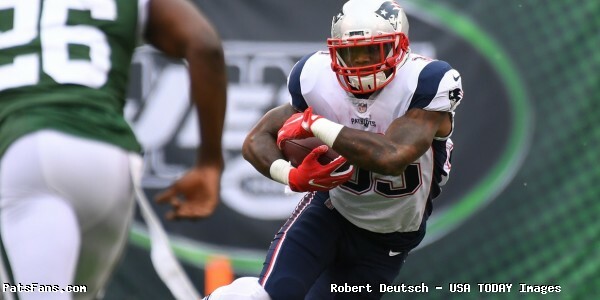 This entry was posted in 2018 Patriots Training Camp, NFL Commentary, NFL News, Patriots Commentary, Patriots News and tagged 2018 Patriots preseason, 2018 Patriots season, 2018 Patriots Training Camp, 53 Man Roster Projection, Adrian Clayborn, Bill Belichick, Chris Hogan, Deatrich Wise, Derek Rivers, Dont'a Hightower, James White, Julian Edelman, New England Patriots, NFL, Patriots, Patriots edge rushers, Rob Gronkowski, Stephon Gilmore, Tom Brady, Trey Flowers on August 9, 2018 by Steve Balestrieri. With the first week-plus of the Patriots 2018 training camp in the books, it is time to do another look at our New England Patriots 53-man roster projection. So far, without the benefit of an actual game situation of a preseason game, we’ll have to go with what we’ve seen in the practice sessions thus far. This week’s first tilt against the Redskins ought to be very interesting of how things begin to play out, especially with some players being hurt already. Sony Michel suffered a knee injury on Wednesday that will have him out for a while after having his knee drained of fluid. It is a big setback for his development. But Burkhead, White, and Hill seem poised to be fine for now. Hill could lose his spot if Michel is given a clean bill of health early. Bolden makes the cut this time for his STs ability. 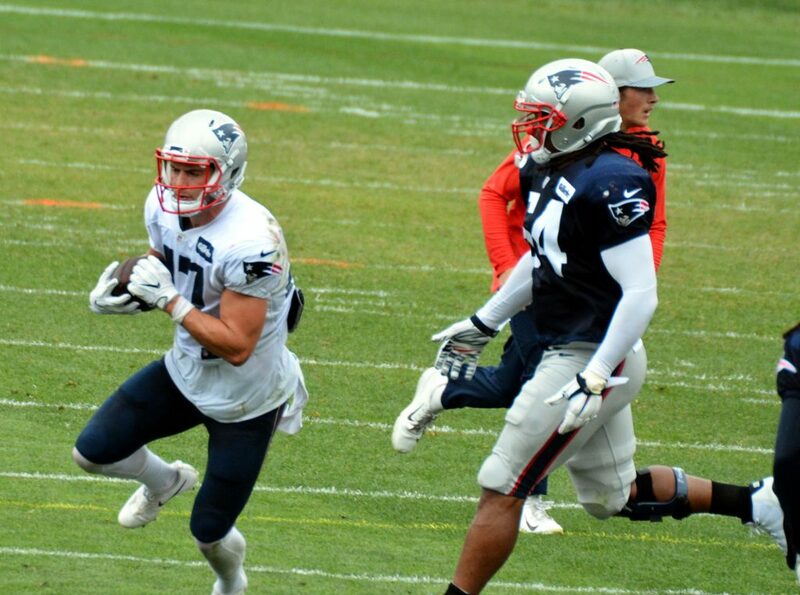 Develin is the fullback and isn’t going anywhere. No changes here. Hollister is having a very solid summer and is working his way into Tom Brady’s “Circle of Trust” which is a very good sign. No one is stepping up to challenge Allen for his blocking TE prowess and he’s looking better in the passing game. Gronkowski looks to be on a pitch count and has been very sharp. Edelman’s suspension is a big loss for the first month but may prove to be a blessing. He was complaining this week, that he’s not feeling in shape yet, or as he termed it, “football shape.” Jordan Matthews’ injury was also a blow and then the team signed Decker, who isn’t a lock yet and has only practiced once. But he’ll have to show he fits in. For now, he’s in. Dorsett is having a good summer (Ditto for Patterson), and his move inside is looking like a smart one. Britt is just getting back on the field but has plenty of time to get caught up now. Both Riley McCarron and Braxton Berrios go to the practice squad but are just a step away from active roster because of punt return duties, however, if anyone else gets hurt or stumbles, they could move up. Slater who is a WR in name only makes the cut too. The state of the offensive line is still a bit in flux, but Trent Brown is looking like the left tackle for now. Isaiah Wynn has struggled with his consistency right now, not surprising for a rookie but he’s going to challenge for either the LT or LG position soon. I could see Cole Croston or Ted Karras easily slipping up here as well. No changes here, Adam Butler could easily step into a spot here. Wise has looked outstanding thus far. Flowers and Clayborn have been ok, but are probably pacing themselves. Rivers is coming on again and will be really intriguing to watch. I like what I’ve seen from 2nd-year edge player Keionta Davis in very limited views. He may rate a practice squad role. Christian Sam has been invisible so far and goes to the practice squad. Both Roberts and Bentley make the roster and each has had good moments. Having a healthy Hightower back this fall is a must. 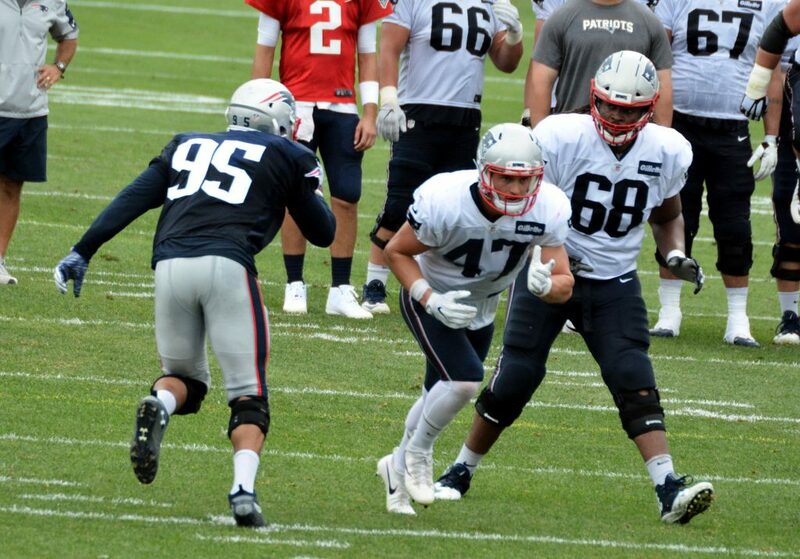 Van Noy and Flowers are having good camps thus far. King is an ST ace but practices with the LBs. Gilmore is having a tremendous offseason. McCourty and Rowe and rounding into form. Dawson has looked mostly good in the slot. But Jackson, who shined in minicamp continues solid play. Lewis, the 2nd year corner from the practice squad, has the size and has played very well this summer. His rise bumps 7th rounder Crossen off the roster as the rookie has had trouble staying on the field with back spasms. Cyrus Jones could still be the team’s punt returner but he hasn’t been seen on the field yet, still recovering from ACL surgery and begins the year (with Jonathan Jones) on PUP. Once again I’m leaving Jordan Richards off the roster but Bill will prove me wrong again. He actually has made some good plays so far in camp but has also been roasted fairly regularly. Eddie Pleasant could easily change the coaches’ minds about his status and has been okay. The position is solid with the top three…but I am still stinging over the Titans signing Kenny Vaccaro this week. Allen now noses just above Corey Bojorquez, who has the much stronger leg but still struggles with his consistency. But this battle will go back and forth right until the final roster cuts. Gostkowski and Cardona have no competition in camp and are locks. This entry was posted in 2018 Patriots Offseason, 2018 Patriots Training Camp, NFL Commentary, NFL News, Patriots Commentary, Patriots Injuries, Patriots News and tagged 2018 Patriots offseason, 2018 Patriots season, 2018 Patriots Training Camp, 53 Man Roster Projection, Adrian Clayborn, Bill Belichick, Chris Hogan, Deatrich Wise, Derek Rivers, Dont'a Hightower, James White, Julian Edelman, New England Patriots, NFL, Patriots, Patriots edge rushers, Rob Gronkowski, Tom Brady, Trey Flowers on August 6, 2018 by Steve Balestrieri. Good morning, Here is your Sunday’s Patriots news 8-05, & AFC East Notes. The Patriots are getting the day off today from training camp, but we hope to see many of you down there in the coming days as the team gears up for their first preseason game. With the birthday of Tom Brady on Friday, the Patriots made enough birthday cake for Brady and 5000 of his fans. Shaped in a big #12, the cake consisted of 2000 eggs, 250 pounds of sugar, etc … all of which are usually strictly off-limits for Brady’s diet. He was surprised after practice by his wife and kids on the field. And was serenaded by both fans and teammates as he got a rare off-day in training camp. 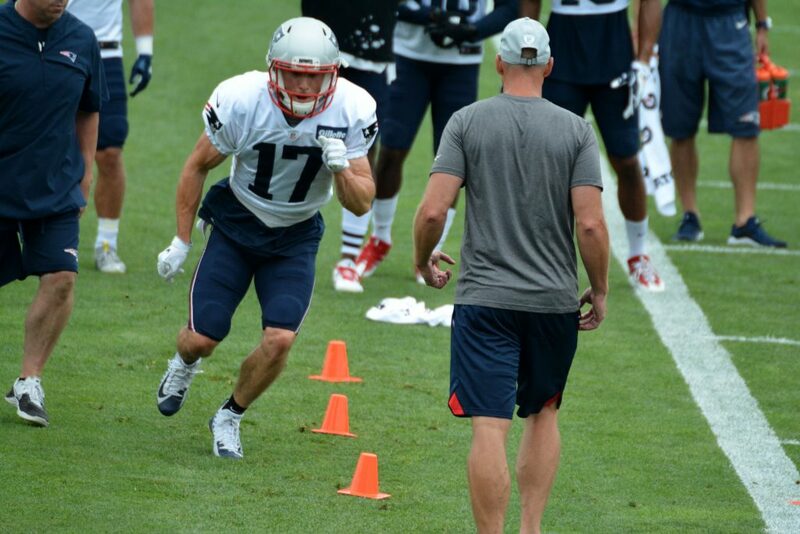 Riley McCarron is having a pretty good training camp thus far, the 2nd year practice squad player is vying for one of the Patriots WR spots on the roster. McCarron and Braxton Berrios are almost mirror images competing against one another for the slot/PR duties. Both are similarly built can return punts and good in the middle of the field. While there is a long way to go, McCarron may be slightly ahead of the rookie at this point, but this will bear very close watching once the preseason games begin. J.C. Jackson has been having a strong offseason, dating back to OTAs. The UDFA from Maryland has been getting some reps opposite Stephon Gilmore and has competed hard and showed nice flashes of potential. He shook off a rookie mistake against Chris Hogan, not locating the ball in time on a 50+-yard completion by breaking up a pass in the end zone and intercepting a two-point conversion try. 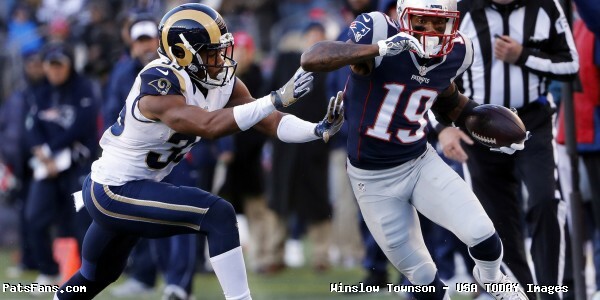 Kenny Britt, Matthew Slater, and Mike Gillislee returned to practice after missing time due to injuries. That is a good sign as injuries, most of the non-serious nature begin to pile up. The Patriots signed UDFA TE Jacob Hollister a year ago and he flashed enough athleticism, good hands and toughness to make the team. After playing sparingly in 2017, he set about to improve his all-around game starting with becoming a better blocker in the running game. He looks a tad more chiseled this season after a year in the strength and conditioning program but his pass catching looks right on schedule. Hollister has made several standout plays during the first week of training camp. Showing good hands and the ability to find the open areas of coverage and attack the seams of the defense, Hollister is a much more fluid receiver than the current #2 Dwayne Allen, but Allen’s blocking skills remain his strong suit. While the highlighted text was my doing, this kind of praise is rare from Belichick. And he’s right, although he says this about everyone, Hollister still has a long way to go. But he’s definitely arcing in the right direction. With the uncertainty at the WR position as it sorts itself out, the Patriots offense could easily lean more on the running game and two tight end sets (12 personnel) in the first month of the season until Edelman returns. Watching practice at training camp this week, Tom Brady usually throws a side session during Special Teams drills with his “Circle of Trust” receivers, normally Gronkowski, Hogan, and Edelman. Hollister was included in there this week a few times. That in itself is a very encouraging sign, we’ll see how the preseason plays out. With the abundance of stories from players, some of whom have never stepped foot in the Patriots locker room that the team doesn’t have any fun, this week’s events should effectively put those to rest…well not really but you know what I mean. On Monday Night, the in-stadium practice for the season ticket holders, Bill Belichick ended practice on an interesting note. He had rookie OL Isaiah Wynn back fielding a Ryan Allen punt. If Wynn catches the ball cleanly, the team was didn’t have night meetings on Monday night and could get a little extra rest. With the team cheering him on, Wynn dropped the first attempt but caught the second, amid wild cheers from the players and fans and big smiles all around, even from Belichick. It should be noted here that these are things that Belichick has done frequently in the past and it was not him reacting to the crap that is posted in social media, not that he would anyway. But for the team known as the buttoned-down all business Patriots, it is always good to see them lower the guard a bit. The front seven of the Patriots defense was beset by injuries in 2017 and that was the cause of many of their struggles. As much as people want to point at the lack of Malcolm Butler as the cause of Super Bowl failures, the absence of Dont’a Hightower was an even bigger factor in their struggles. But initially, on paper, for now, things are changing for the better. The team added run stuffing DL Danny Shelton and he and returning from IR Vincent Valentine should really help the rotation inside. Hightower and Harvey Langi return from IR which should help the LB core play much better. But at the edge is where the team is looking to play much better in 2018. The team went out and signed DE Adrian Clayborn during free agency. Clayborn isn’t a dynamic “hair on fire” pass rusher, but a very solid, big, veteran presence who should help solidify things. And the trio of young edge players, all just 24 years old should, with Clayborn be much better against the pass and the run. Trey Flowers is the elder statesman of the DLine, having been there the longest but he’s still just reaching his peak where many predict an All-Pro season for him. Deatrich Wise is having an outstanding camp and is making a big jump in play so far this summer. And Derek Rivers, last year’s top draft choice who missed all of last year with an ACL injury is over that now and beginning to come on in the 2nd week of training camp. These players are the top 4 rotation that should help the defense be much improved in 2018. Eric Lee who played last year and the under-the-radar Keionta Davis who missed all of his 2017 rookie season with a neck injury and Trent Harris are all still in the mix. The front seven will bear considerable watching in the preseason but the edge players are the ones poised to look vastly different. We’ll keep you updated as camp rolls along. The Patriots traded just a 6th round draft choice for LB Kyle Van Noy in 2016, but the linebacker has worked his way into becoming a key contributor and leader in his second full season in New England. With Dont’a Hightower injured last year, a lot was forced onto Van Noy’s plate including the mantle of leadership, something he’s embraced. Now with Hightower back, Van Noy can return to do the things he’s better suited for on the outside and is penciled in as a starter for 2018. Bill Belichick was very complimentary about the level of play and the mentoring he’s shown with the younger players at one of his daily press conferences this week. The fact that the Patriots were able to snag the former 2nd round draft pick (40th overall) and a 7th rounder for just a 6th round pick has been an outright steal for Bill Belichick. They found a role for Van Noy and he’s met their expectations and has had more put on his plate. He should be much more effective with Hightower back in the fold this fall. The Buffalo Bills signed Virginia Tech UDFA WR Cam Phillips to a deal this spring that paid him a signing bonus of just $600. Yep, that isn’t a typo, but the WR has used that slight to motivate him to earn the trust of his QBs and coaches. And the young WR is doing just that. Phillips has shined in the first week of training camp that has many re-evaluating him as a long shot to make Buffalo’s 53-man roster to a player that now has a really good shot of doing so. Phillips has been making some big plays in practice every day, something that is getting the attention of the coaching staff. With a WR position that is wide open, Phillips is making a spot for himself at the table. Now he’ll have the chance to do some work once the preseason games begin. The Miami Dolphins already had a pair of talented safeties in Reshad Jones and T.J. McDonald before drafting the very talented Minkah Fitzpatrick, the glue from the National Champion Alabama defense with the 11th overall pick in this year’s draft. Now the issue is getting all of the pieces gainfully employed. Dolphins defensive coordinator was asked this week when he “has to” get the three of them on the field together. Burke wasn’t having any of it. “I don’t have to,” he said. The three will eventually see the field in practice at the same time to iron out any potential issues they may encounter with communication. The Patriots use a similar grouping with Duron Harmon joining Devin McCourty and Pat Chung. For now, it is still early in training camp for the Dolphins and it is a good problem to have as they an abundance of talent at the position. The New York Jets may have made a mistake in letting TE Austin Seferian-Jenkins walk in free agency this spring. As it looks right now, they may struggle at the position in 2018. Jenkins is now a member of the Jacksonville Jaguars and the Jets don’t have an answer at this early stage of training camp. In a piece written by Luis Tirado for the JetPress, Tirado says the Jets haven’t had Jordan Leggett who is injured and thus far Chris Herndon, Eric Tomlinson, Neal Sterling, and Clive Walford haven’t done anything to stand out positively. Any quarterback’s security blanket is usually their tight end, it may be especially so if the Jets top draft Sam Darnold wins the starting job this summer once the preseason games begin. Without having a credible target at tight end will hurt even an established veteran like Josh McCown, with a young QB like Darnold, it could prove even more so. This entry was posted in 2018 Patriots Offseason, NFL Commentary, NFL News, Patriots Commentary, Patriots News and tagged 2018 NFL Season, 2018 Patriots preseason, 2018 Patriots season, 2018 Patriots Training Camp, 53 Man Roster Projection, Bill Belichick, Buffalo Bills, Chris Hogan, Dont'a Hightower, James White, Julian Edelman, Miami Dolphins, New England Patriots, New York Jets, NFL, Patriots, Patriots edge rushers, Patriots Training Camp Photos, Rob Gronkowski, Tom Brady, Trey Flowers on August 5, 2018 by Steve Balestrieri. Last year we were amazed at how mature DE Deatrich Wise looked for a rookie. He carried himself and had the look of a player well beyond his 23 years. Now just 24 and beginning his second season, Wise is relentlessly pursuing his craft with a never-ending search to improve and become a better, all-around, more productive edge defender. Wise had a decently productive season in 2017 for a rookie and notched five sacks. But there were many times, the rookie found himself on the bench because he wasn’t quite up to snuff on his complete game. The learning curve is steep for all rookies and he was no exception. Wise isn’t built like most edge rushers, he’s big and powerfully built, listed at 6’5, 275 pounds. While he doesn’t have the athleticism of a Trey Flowers who can drop into short area coverage in the flat at times, Wise would be at a severe disadvantage in a spot like that. But with his size and strength, he’s excellent at setting the edge and can generate the power to bull rush past offensive linemen. Bill Belichick frequently says players normally make the biggest jump in play between Year 1 and Year 2 of their development. Wise made a big splash on Day 3 of training camp when the pads came on when he decleated Jeremy Hill on an inside running play and sent the veteran RB flat on his back. He’s been one of the standout players on the Patriots defense thus far in training camp and after Sunday’s practice session ended around 11 a.m. Wise, Flowers and Derek Rivers stayed on the field working on their pass rush moves. Flowers, the veteran was showing the two younger players a move, then the younger pair would emulate and they went on and on for about 45 minutes. Flowers then left the two second-year players to work on their own for another 10-15 minutes. Rivers then stopped and enjoyed a few moments with his family. Wise continued on, working on a sled with his hand moves under the watchful eye of his ex-college coach Bret Bielema. Finally, he came over to speak with the assembled media. As big and physical as he is on the field, he’s very polite and soft-spoken off of it. He tried to answer every question thrown his way and gave detailed answers. What part of his game is he specifically looking to improve? He was asked. All of it he replied. Wise considers himself a student of the game and is always learning and looking to get better. On Sunday, after a fairly low-key practice, it was go-time. The best battles of the day took place along the goal line, where the offense had done well on Saturday, but Sunday was a different story. Four cracks at the end zone with different alignments and different backs, but the same results. No touchdowns. If the Patriots defense is going to be better than 2017, it will have to start up front. The defense was gashed for 4.7 yards per carry a year ago. With the addition of Danny Shelton upfront, the front line has to solidify. It also includes the edge players as well, everyone working in concert on the line will allow the linebackers to fly up and make plays. Click on the link below to see the interview in its entirety. 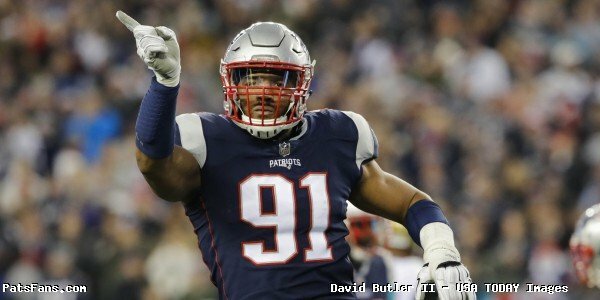 This entry was posted in 2018 Patriots Offseason, 2018 Patriots Training Camp, NFL Commentary, NFL News, Patriots Commentary, Patriots Film Room, Patriots News and tagged 2018 Patriots season, 2018 Patriots Training Camp, 53 Man Roster Projection, Adrian Clayborn, Bill Belichick, Deatrich Wise, Derek Rivers, Dont'a Hightower, New England Patriots, NFL, Patriots, Patriots edge rushers, Trey Flowers on July 30, 2018 by Steve Balestrieri. 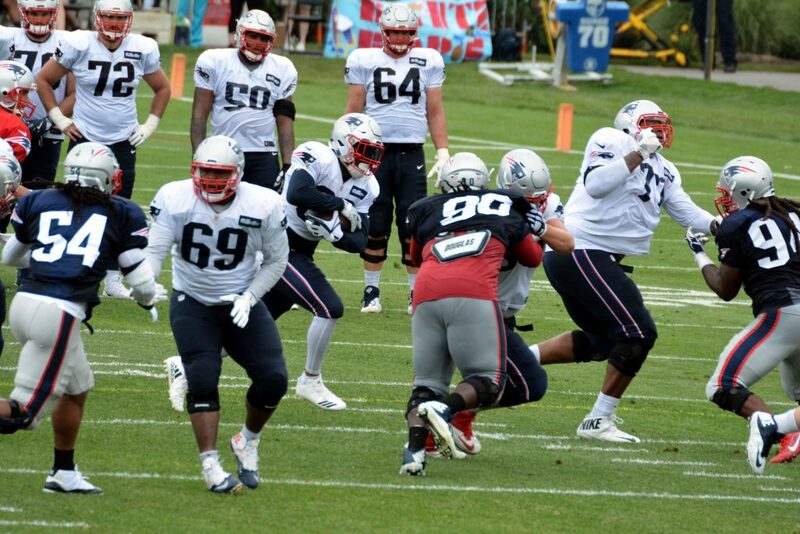 Sunday’s Patriots practice session began shortly after 9 a.m. with sunny and clear conditions. The heat and humidity were dialed back a bit this morning and so was the tempo and intensity of practice. The majority of the fully padded session was conducted in a slower, methodical manner and the hitting was not noteworthy until the end of practice when the Patriots defense absolutely stoned the offense four straight times in goalline. The same players on PUP were missing, of note today was the absence of both RB Mike Gillislee and CB Keion Crossen, who reportedly has been having back spasms. The offense took another hit when Jordan Matthews tweaked a hamstring and left practice. Trey Flowers returned today after leaving the session yesterday with a towel on his forehead. Flowers had a big bandage in the middle of his forehead so he obviously had a pretty good gash there. Play of the Day: At the end of practice, the defense stopped the offense three straight times from the goal line. On the fourth attempt, running back Brandon Bolden had nowhere to go and tried to bounce it outside. Elandon Roberts flew over and popped Bolden good, knocking him backward for a loss. It was a superb way to end the practice. Play of the Day ***Honorable Mention***: Cordarrelle Patterson made a fantastic catch with Eric Rowe draped all over him. Patterson ran a 12-yard pattern where Brady hit him with a back shoulder throw. Rowe read it perfectly and was in perfect position to knock it away. Patterson used his long reach to get his hands on the ball and as he fell to the ground was able to haul it in. He’s been good thru the first four days of camp. And plays like this and the others he’s doing during the first few days of camp will get him the trust of the quarterback. And building that trust is key for the new guys. Stephon Gilmore continues his outstanding offseason. During individual drills, he knocked away a pair of passes. He was ignored during the 11-on-11 drills. Not one pass came his way. Nicholas Grigsby was rocking a hooded sweatshirt under his uniform today at practice. While it wasn’t as hot as some days last week, it wasn’t sweatshirt weather. He must like to sweat. Jordan Matthews gave a nice effort, going horizontal and diving for a deep pass from Tom Brady and coming up just short of the ball. Will Tye ran a nice corner route in the end zone and Brady showed a deft touch and lobbed it right in the bucket for a quick score. Tye had a nice day. 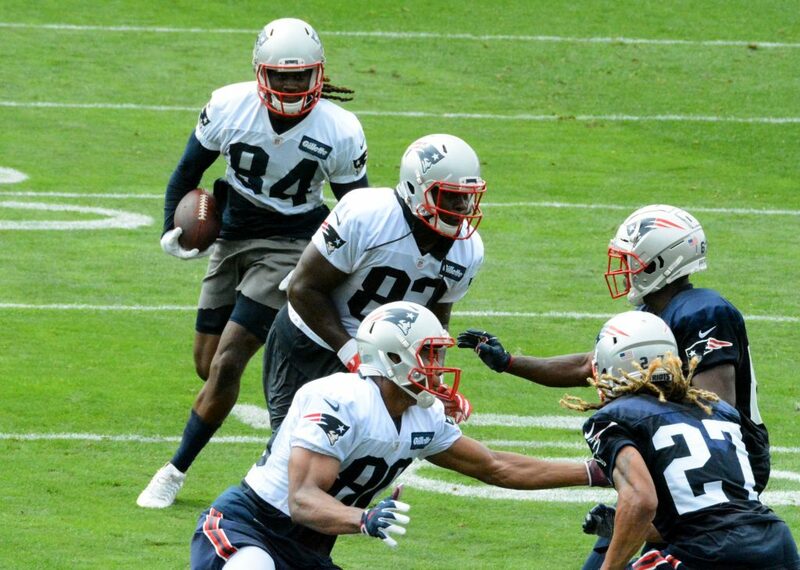 The Patriots were working on the screen and running games a lot in the session today. During 11-on-11 Brady only attempted seven passes, completing five. Brady attempted two deep passes in a row, the first to Chris Hogan, where the WR was open but Jomal Wiltz got there a second before the ball arrived and the second, Julian Edelman ran a deep cross and was wide open down the right side of the field. Riley McCarron was wide open on a deep pattern but Brian Hoyer was late in seeing it and then getting the ball to him. Recognizing it, Jordan Richards raced over and knocked it away. Hogan got shaken up after running a quick slant and getting into a big collision with Rowe but he shook it off and remained out there on the field. Sony Michel caught a screen pass from Brady and took it to the house. The crowd roared. Something tells me we haven’t seen the last of yet, however. Jacob Hollister continues to impress, he ran a seam route into the end zone where he caught a nice back shoulder throw from Hoyer. Loved what I saw in goalline from Danny Shelton. He’s a load in the middle. It allows the linebackers to fill and make plays. He and Lawrence Guy were really strong, especially late. During a special teams segment, Brady threw on the side with Rob Gronkowski, James White, Hogan, Dorsett, and Hollister. Things that make you go hmm. Tiquan Underwood was present for the third straight day of practice. You can’t mistake that hair anywhere. After the session, Sony Michel, Hollister and Deatrich Wise were among the players over speaking with the media. We’ll have more on Wise later…check back on PatsFans.com. 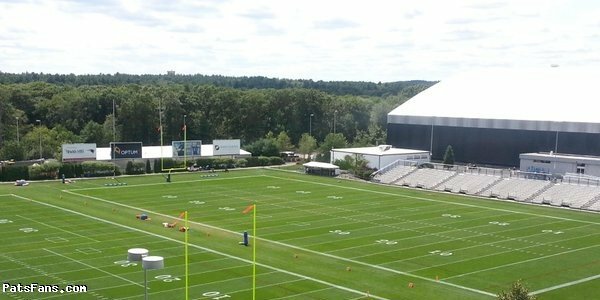 ***NOTE*** Tomorrow’s practice session will be a night practice in Gillette Stadium open to Patriots season ticket holders and Foxboro residents. This entry was posted in 2018 Patriots Offseason, 2018 Patriots Training Camp, NFL Commentary, NFL News, Patriots Commentary, Patriots News and tagged 2018 Patriots offseason, 2018 Patriots Training Camp, 53 Man Roster Projection, Bill Belichick, Brandon Bolden, Chris Hogan, Deatrich Wise, Dont'a Hightower, Elandon Roberts, Julian Edelman, Patriots, Patriots edge rushers, Tom Brady, Trey Flowers on July 29, 2018 by Steve Balestrieri. Good morning, Here is your Sunday’s Patriots news 7-29, & AFC East Notes. 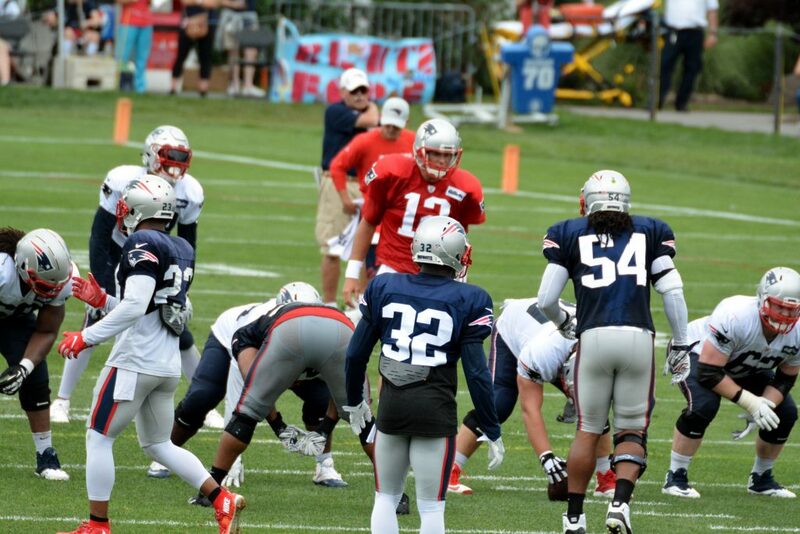 Training camp is in full swing and we hope to see many of you down at Foxboro in the next few days. With the start of training camp, one would have hoped that all of that drama hooey would have been left behind…yet on Day 1, that was not to be. It didn’t end there on Day 3 Tom Brady was asked about another player’s suspension and the connection between him, Alex Guerrero and that suspended player (Julian Edelman). Brady got incensed and cut the interview off, stating, ”This is ridiculous.” And it is. Enough already with the constant search for a conspiracy behind every event. It is time to talk football for the 2018 season. Deatrich Wise had the hit of the summer so far when early in the session on Saturday, he slipped the block of rookie Isaiah Wynn and decleated RB Jeremy Hill, who flew backward and ended up flat on his back. Troy Niklas was released after just two days of training camp, which is a bit of a surprise. The big tight end was in competition to get one of the backup slots. In his stead, the team signed WR Paul Turner who spent four games with the Eagles in 2016. In other moves this week, the team signed safety Eddie Pleasant, guard Nate Theaker and WR Devin Lucien while releasing safety David Jones. Rob Gronkowski said he never considered holding out for a new contract this spring and has looked excellent in the early going. He and Brady were putting on a clinic in early red zone work in camp. 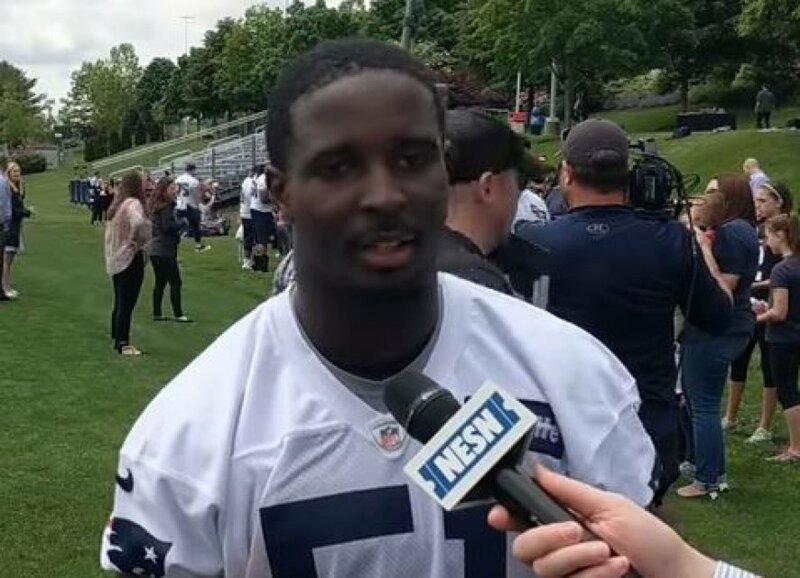 Sony Michel looks like he’s a veteran thus far in camp. 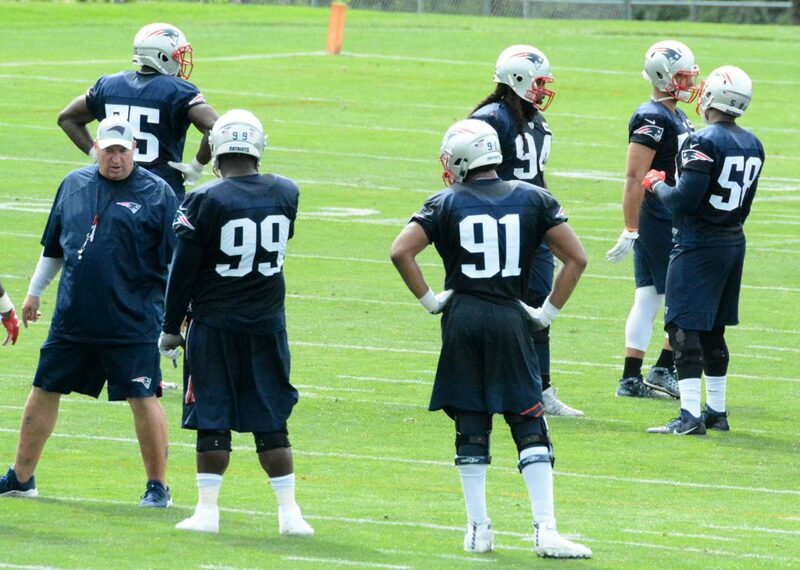 He’s getting reps with Brady and the starters (yes we know Belichick hates using that term in camp). The Patriots put a premium on pass protection, and Michel will have to excel in that area. But thus far, he’s way ahead of schedule and it seems the Patriots are fully invested in him. One area of concern thus far is ball security. Michel has put the ball on the ground in every day (first three) of training camp. That will have to change. Dwayne Allen was a factor in the passing game during the practice sessions on Friday. The big blocking tight end was an afterthought in the passing game in 2017 and his performance in the heat was a welcome addition. Coincidentally after a strong spring and good first day, second-year tight end Jacob Hollister had a pair of drops on Friday. Cordarrelle Patterson had a nice day on Friday, and while there is a long way to go, it looks like the team is trying to find a comfort level for the big, fast WR in the offense. And his one-handed TD grab over Stephon Gilmore on a pass from Tom Brady was the kind of good news that we hope to see continue. And he did with another nice catch from #12 on Saturday. Jason McCourty also had a nice day on Friday, looking very competitive and breaking up some passes in the end zone. He continued his strong play on Saturday. The Patriots traded backup QB Jacoby Brissett to the Colts early last season for WR Phillip Dorsett and while he didn’t make a big dent in the passing game a year ago, that looks like it will change drastically in 2017. Dorsett was targeted just 18 times last year and caught just 12 but with a year in the system, he is looking like he’s ready for a much bigger piece of the pie. With Julian Edelman out for the first four weeks of the season due to a PED suspension, there will be plenty of opportunities for a player to step up at the inside wide receiver. And Dorsett, this summer is getting in a lot of work inside. Both he and veteran Jordan Matthews are working in the slot as well as 2nd-year player Riley McCarron and rookie Brandon Berrios. Dorsett besides possessing great straight-line speed, has excellent quickness, running a 6.70 3-Cone-Drill back when he went thru the NFL Combine. This will be an intriguing area to watch this summer. With the departure of Matt Patricia, this winter to take over the head coaching duties of the Detroit Lions, Brian Flores’ responsibilities have been expanded to become the signal caller for the Patriots defense. While he’s the Defensive Coordinator in everything but name, he has a lot more on his plate. But for the veteran signal caller on the field, Dont’a Hightower, Flores is already receiving high marks for the job he’s doing teaching the Patriots system to the younger players, especially rookie linebacker Christian Sam. Devin McCourty, however, pooh-poohed that assertion saying that nothing has changed under the Patriots defense and everything and everyone is on the same page. During the spring, Hightower got the fan base a bit more excited by saying that under Flores, the Patriots defense will be much more aggressive this year. One area that the team struggled in during the 2017 season was the ability to consistently get to the QB. With Trey Flowers, Deatrich Wise and 2nd-year player Adam Butler returning, the team signed Adrian Clayborn from the Falcons during free agency and now they’ll get a healthy return of Derek Rivers, their top draft pick from last year who missed the entire season with an ACL injury. While the mantra of the Bill Belichick defensive philosophy has always been to play conservatively and keep the play in front of them, there are some ways that this team could still stick within the Belichick system and play a bit faster. I’d look for some 3-4 looks to go along with their 4-3 and 4-2-5 packages and see them getting a bit more game plan specific in 2018. Speaking of the defense, there was one person who we said all season was irreplaceable for the unit and that was Hightower. His loss was felt all last season and while everyone wants to talk about how the absence of Malcolm Butler hurt in the Super Bowl loss to the Eagles, a much bigger factor was not having Hightower in there against Philly. And nothing has changed, on the Patriots defense, he’s the one player they can least afford to lose. After Patricia was forced to move him to the edge exclusively early last year, he back at the middle linebacker position, where he’s most effective. And the trickle-down effect begins. That allows Kyle Van Noy to move where he’s more effective on the outside. He took on much of Hightower’s role a year ago and they’re very different players. Was it coincidence on Friday that Van Noy was having a big day breaking up passes? In the first two days of camp, he’s broken up four, as the Patriots are freer to move him around a bit more to take advantage of his athleticism. It will be interesting to see how the position changes this season. Hightower and Harvey Langi return from IR, they added Ja’Whaun Bentley and Sam thru the draft and still have returning veterans Marquis Flowers, Elandon Roberts and Nicholas Grigsby in the mix. On paper at least, it is still the thinnest on the team and the one guy that they can still ill-afford to lose is Hightower. Etling, who was a 7th round draft choice (219th overall) this spring had mechanics issues to work thru. Watching him perform in the SEC the past two seasons, he frequently threw the ball flat-footed, rarely if ever setting his feet and relied on his arm strength to get the ball out, causing his passes to sail and diminished his velocity. That won’t get it done in the NFL and give the rookie credit, he has put the extra work in. We read that he’s working with QB/MLB throwing guru Tom House. His mechanics look much improved and thus far ( it is still very early) he’s looked much better than what was expected of him. Does this mean, he’ll push Hoyer for the backup job to Brady? Hardly. He has a long, long way to go and will have to learn all the nuances of the Patriots playbook and grasp the offense. But to see this first…albeit baby step is encouraging. Add in that he’s staying on the field for nearly 30 minutes after practice to work on his footwork, mechanics, and timing and route concepts, is another nice sign. For a guy fighting for a roster spot, he is doing all the right things so far. Now we’ll see if he can keep progressing as camp unfolds and the preseason moves on. The Buffalo Bills have three QBs vying for reps in training camp and into the preseason this summer and it’ll bear watching this summer. Top draft choice Josh Allen signed his contract and is in camp, the team traded for A.J. McCarron with the Bengals and have veteran Nathan Peterman who was thrown into a disastrous first start last year but bounced back nicely after that. McCarron led Alabama to a national title but this is his first opportunity to start. He’ll try to hold off Peterman and the rookie Allen. Allen is their QB of the future, but Bills coach Sean McDermott has made it clear, that the team won’t push their future QB into game action before he’s ready. That’s why they brought in McCarron. When it comes to arm strength, Allen is head and shoulders above the other two, but as we’ve seen, playing QB in the NFL is much more than that or else Jeff George would be in the Hall of Fame. The Miami Dolphins are trying to work Danny Amendola in the slot where he was so valuable for the Patriots the past few years. And QB Ryan Tannehill, who missed all of last season with a torn ACL is working hard to build his chemistry with the tough but diminutive wide receiver. But not everyone is happy with the work being turned in by the Dolphins QB. Dolphins beat writer, Omar Kelly who is known for his over the top tweets was writing that Tannehill is leading Amendola into a huge collision. The New York Jets have started their 2018 training camp and have done so without the services of QB Sam Darnold. The talented USC signal caller was the #3 overall pick in this spring’s NFL Draft and his contract was thought to be an after-thought. But that hasn’t worked out and his early absence may hurt his chances to start in his rookie season. Darnold is expected to push long-time veteran Josh McCown and Teddy Bridgewater for the starting job this summer, but this unexpected snafu is throwing a monkey wrench into the works. According to ESPN’s Rich Cimini, the two sides have sharp differences on certain clauses and language in what will be a four-year, $30.2 million deal, fully guaranteed. Coach Todd Bowles however, isn’t worried. “It’s just another day in the office. There’s no animosity. It’s just the business part. When he comes in, we’ll get him caught up to speed and get him ready to go, Bowles said. “I’m not frustrated,” Bowles added. “I’m a coach.” He said that as soon as the two sides agree on the deal, that the Jets would quickly bring Darnold up to speed. 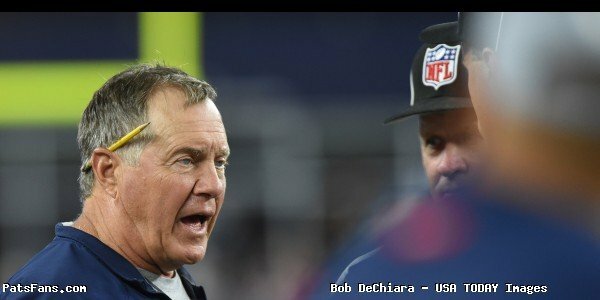 This entry was posted in 2018 Patriots Offseason, NFL Commentary, NFL News, Patriots Commentary, Patriots News, Patriots Rumors, Patriots Twitter, Patriots Video and tagged 2018 Patriots offseason, 2018 Patriots season, 2018 Patriots Training Camp, 53 Man Roster Projection, Bill Belichick, Buffalo Bills, Chris Hogan, Cordarrelle Patterson, Danny Amendola, Deatrich Wise, Dont'a Hightower, Jordan Matthews, Julian Edelman, Miami Dolphins, New England Patriots, New York Jets, NFL, Patriots, Patriots wide receivers, Rob Gronkowski, Tom Brady, Trey Flowers on July 29, 2018 by Steve Balestrieri.